Le Petomane was a amazing character -his real name was Joseph Pujol, he made his name in Paris and all France, and abroad. He was born in Marseilles on June 1st 1857 and died in Paris in 1945. 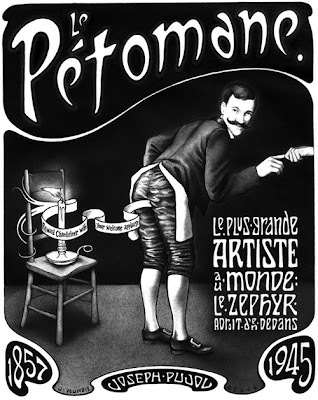 Le Petomane was the stage name of the French flatulist (professional farter), he was famous for his remarkable control of his abdominal muscles which enabled him to seemingly fart at will. His name combines the French verb peter (to fart) with the -mane- maniac suffix which translates to "fartomaniac", the profession is also referred as "flatulist" , "farteur", or "fartiste". His audience included the Prince of Wales [the future Edward VII], King Leopold II of the Belgians and even Sigmund Freud. He died in 1945 aged 88. The Sorbonne offered his family a large sum of money to study his body after his death, but they refused the offer. Leonard Rossiter played Le Petomane in a film. Le Petomane would command large fees for his concerts in which he played all the tunes of the day and various national anthems like God Save The King and the Marseillaise, with his rear end. And he made people laugh, something many politicians can't do. Miliband, Farage, Cameron, Salmond, Hollande will never make people laugh, but they are laughable and boring . . . And this applies also to leftists who congregate in halls to discuss the class system in 2014 . . . The characters of Historical Materialism come to mind . . . Some even pretend to be into the Situationist International, but they prefer to forget what the SI slogan said namely that:"boredom is always counter-revolutionary". Some even try to speak of the critique of value, but for them the class issue is always paramount, so they forget the essential . . . Hence the boredom at all the meetings. And no one laughs there. Even Le Petomane was better than them . . . It is incredible, laughable and sad . . . It was a great fun to be an anti-historian writing about an anti-musician like Le Petomane.